You see that the compound's name is followed by the brief summary of its physical properties (color, solubility in water), general notes on its stability under ambient atmosphere, and then the list of the chemical reactions which were considered by the authors to be the most important or illustrative for this particular substance. The question is - are there any reputable handbooks that are similar to this one, with not only the summary of the physical properties, but the summary of possible chemical reactions as well, or is this book one-of-a-kind? Настоящее пособие носит информационно-справочный характер, не имеет аналогов в отечественной и зарубежной химической литературе, охватывает все разделы неорганической химии, изучаемые в химических вузах. (English) This reference handbook has no analogues among domestic and foreign chemical literature, covers all inorganic chemistry sections studied in university chemistry course. Турова, Н. Я. Неорганическая Химия в Таблицах; Высший химический колледж РАН: Москва, 1997. 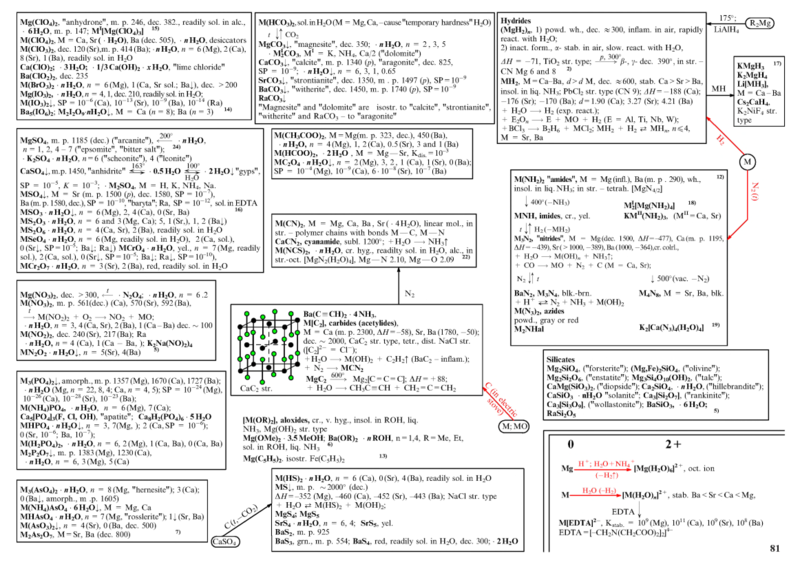 Turova, N. Inorganic Chemistry in Tables; Springer: Heidelberg ; New York, 2011. ISBN 978-3-642-20486-9. I am not aware of a list like this however, the biggest database on Earth of inorganic materials/reactions is the Gmelin Handbuch der Anorganische Chemie. Obviously in German since late 1770s and specific to element by element. The later editions started in English since 1970s. It is descriptive unlike the reference you have mentioned. Reaxys (Elsevier) has taken over Gmelin Handbuch and its organic counter part Beilstein. All in English. Not the answer you're looking for? Browse other questions tagged inorganic-chemistry reference-request books or ask your own question.